Mayor’s Trophy Mystery: Did Nettles Really Try To Throw A Game? Long before interleague matchups, the Yankees and Mets used to play a somewhat annual exhibition known as the Mayor’s Trophy Game. The popularity of the game, which was played to benefit the city’s Amateur Baseball Federation, ebbed and flowed from the time it was inaugurated in 1946 (as a three way series involving the Yankees, Giants and Dodgers) until the last Yankees vs. Mets matchup in 1983 (the two teams also played a home-and-home series before the starts of the 1989 and 1990 seasons, but those games were not dubbed the “Mayor’s Trophy”). New York City Mayor Robert F. Wagner displays the "Mayor's Trophy" along side Dodger manager Walter Alston and Yankee manager Casey Stengel before the annual exhibition on May 23 1957. 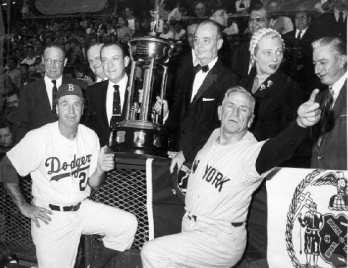 With the Dodgers and Giants moving to California, it would be the last Mayor's Trophy contest until the Yankees and Mets revived the tradition in 1963. By far, the biggest lull in the series took place during the mid-to-late 1970s, when the Yankees were distracted by their own internal sideshows and the Mets were downright awful. During that period, attendance for the game plummeted (to as low as 9,792 in 1978) and interest among the players waned. In fact, the desire to play in the game was so low that it gave rise to perhaps the most infamous event in the Mayor’s Trophy: Graig Nettles’ alleged attempt to literally throw away the 1978 game. According to Sparky Lyle’s chronicle of the 1978 Yankees, The Bronx Zoo (which is highly recommended reading for any baseball fan), the Yankees veterans grew increasingly restless as that year’s intra-city exhibition went into extra innings. At one point, Lyle recounted, Graig Nettles went up to him and vowed to take matters into his own hands by purposely making an error on the next ball hit his way. And, sure enough, that’s exactly what happened when the Mets’ Ron Hodges opened the 11th inning with a ground ball to third base. Unfortunately for Nettles, despite having a man on second with no outs, the Mets were unable to plate the run, thanks in large part to a great defensive play by Yankees’ second baseman Brian Doyle. It may have been funny to some of the Yankees’ players, but you can bet it wasn’t funny to George Steinbrenner, who by all accounts looked at the Mayor’s Trophy Game as a must win. In fact, Lyle’s entire book didn’t amuse the Boss. Regarding his accusation about Nettles, Steinbrenner responded, “Everybody says he’s a buffoon. He’s not a buffoon. He’s one of the least intelligent athletes I ever met”. Amid the firestorm that the allegation created during Spring Training of 1979, Nettles did issue a public denial. Although he insisted that he did no wrong, Nettles’ response was far from a rebuke of Lyle’s account. So, did Graig Nettles really attempt to throw both a ball and a game away against the Mets, making him the Chick Gandil of the Mayor’s Trophy Game? Well, his denial wasn’t exactly vehement, and Lyle never did recant the stain he placed on his good friend, so there’s a good chance Nettles did make an error on purpose, especially when considered in light of the corroboration that Brian Doyle’s later recollection gives to Lyle’s account in his book. Although the incident has mostly been forgotten, and given way to the Clemens/Piazza saga in terms of Yankees/Mets infamy, it still serves as a microcosm of the two teams during that period in time: the rowdy and rebellious Yankees who were capable of doing just about anything on or off the field, and the hapless Mets, who weren’t even capable of winning a game that their opponent was trying to give to them (the Yankees wound up winning the infamous extra inning affair on a walk-off squeeze bunt by Fran Healy, who would go on to serve as a long-time broadcaster for the Yankees and Mets). After the 1978 incident, the game would only be played three more times (1979 and 1982-83). Since then, the teams have played countless regular season games as well as the 2000 World Series, but the Mayor’s Trophy still holds a unique place in the city’s baseball history…one worth rediscovering from time to time. Sounds like an awesome memory. The game took place on June 27, 1960 and the Dodgers won 4-3. It wasn’t called the Mayor’s Trophy Game, however, because the Dodgers had moved to LA two years earlier). Instead, it was just an exhibition played to benefit United Charities. The year before, the Yankees played a game in LA to benefit Roy Campanella, so the Dodgers were likely returning the favor. As you mentioned, there was a HR contest beforehand…two in fact: one for lefties and one for righties. Mantle won both (tied with several others from the left side), but only hit three total, so the contest was a far cry from what we know now. Interestingly, there was a rumor circulating at the time about an impending deal between the two teams: Don Drysdale, Gil Hodges and Duke Snider would go to the Yankees for Tony Kubek, Elston Howard, Ryne Duren and Johnny James. Buzzie Bavasi discredited the rumor before the game, but can you imagine if it went down? The losing pitcher was Mardie Cornejo and the winning pitcher was Ken Clay. Also, Fran Healey bunted the ball and Jim Spencer scored the winning run, so everyone may have been running, but that doesn’t mean they were moving very fast :). Hey, that’s great, William — how did you come by the pitchers of record? Clay and Cornejo were exactly the type of guys who appeared in the MTG. The info came from an UPI write up that was published in the Norwalk Hour. Thanks for sharing. Ball Four is great, but I think the Bronx Zoo shaped/warped my perception even more when I was a kid.